A successful e-commerce site maintains sustainable growth. With its unique customer engagement activities, your site can have a free flow of sales and customers. Achieving this growth happens when you follow trends that help you make strategic decisions. Magento 2 is the most flexible e-commerce platform, which helps you build world-class eStores. In this article, we will look at the top 3 e-commerce website design tips (more like strategies) and why Magento is a perfect choice to help you achieve the much-needed growth. Your customers may be baby-boomers to Gen-X’s, gender to free-genders, Magento is a high-flying-friend. None of these customers permit ‘would-be’ or ‘could-be ‘stitches in the online store. They demand a faster, easier and cost-effective way to shop online. They look for never before UI/UX experience. Most of the e-commerce customers expect their shopping to be a mollycoddle. A website tailored as per their needs. 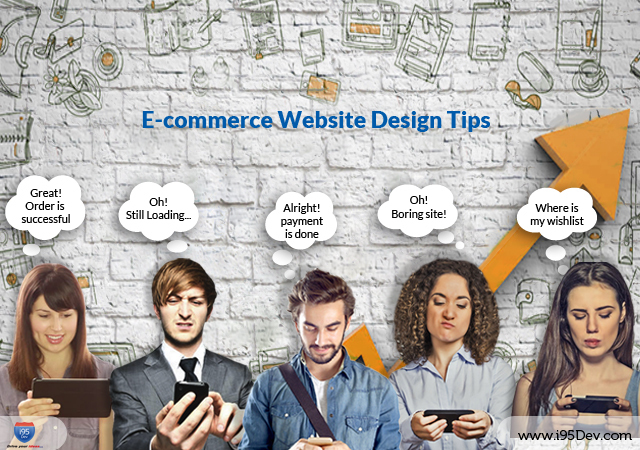 Launching an e-commerce site is not enough to be a successful e-business. Nowadays, a performing website is one with which talks to the customers. One example challenges in building a website which can influence the customer are the choice between responsive and adaptive website design. A responsive web page is much easier for the Google to index. But, online customers prefer an adaptive website that is accessible on any portable device. Another advantage of adopting web designing is that they take lesser time to load. But, these techniques are not future-proofed. There are some implementation issues. The image adjustments to the design could be a complex process. for example, a 300-pixels wide smartphone display and a 500-pixel wide desktop display. We need a tweaked design layout for each type of screen. Hence, many e-commerce sites opt for a responsive website. Designing a responsive website does not mean that you provide the information as is. Many consumers often leave the website because the results are often irrelevant. Thus, there are some standards set for developing and designing an e-commerce site. This can influence and engage your online customers. The American Disability Act ( ADA) has come up with a new rule for an online business that they should help the disabled to access their services and products online. In 2016, almost 240 lawsuits were filed against those websites that are unable to help disabled persons to access. So, it extremely important to design your websites with disabled customers in mind especially if you are in B2C e-commerce business model. The label of the web forms outside the form layout. Limit side-by-side forms to single forms. The step-by-step process involved in the shopping cart and checkout page are provided on a single page. This feature is available only in Magento 2. This helps the visually disabled persons to fill the details in one page or updating the address. These are recommended whenever an action is to be taken by the online user. Accessible Rich Internet Applications (ARIA) is a way to make Web content and Web applications more accessible to people with disabilities. Visual content elicits an emotional response and sets the mood of your customer. Online visitors read only 28% of the words during an average visit. In the same reference, it is also mentioned that in order to make your website search engine friendly, you need to make it easy for the search engine to scan. Solid colors do not allow visitors to distract. You can use any number of ornaments to your website in the form of typographic fonts etc., just make sure you use visual-audio-contrast ratio. Color contrast improves legibility. Many think if the website looks good, it can take off in the cyberspace. Being good doesn’t mean looking good with animations and flash. Graphics definitely play a crucial role in improving engagement. But, for the website to be good, creating extras in terms of presentations, videos etc. on your homepage is necessary. Videos are generally large files. If you are using them on your business website, it means you are actually indulging large files on to your website host. Every time when a customer clicks on the video, it takes time to transfer data. Thus, takes time to load the video and the webpage. This is another must-have website feature. People often confuse with the concept of a carousel. Many think slider as a carousel. But slider is one that allows images one after the another. Carousel is one that the images are displayed in the circular conveyor. You need to adjust the image size used as per the device the user uses. Many think having a menu on all page is important. But, it is not necessary. There are certain pages where you do not want the user to navigate other pages. For example, the checkout page. Once a decision is made to buy the product, you want the user needs to go ahead with the payment process. If you provide the menu on that page, there is a possibility of your customer to change his mind anytime. If you are placing text over images make sure that it is readable. To make it readable provide adequate contract color. Choose buttons, CTA with a bright color and highlight it with a text message in a contract light color. Amazon discovered that every extra 100ms of page load time led to a one percent decrease in sales, and Walmart found that page speeds of one to two seconds were twice as likely to convert. 53 percent of users are abandoning a mobile website completely if it doesn’t load within three seconds. Make sure that the web hosting provider has servers to provide you mini time to the first byte. Time to the first byte is the time taken for the browser to contact the website server and receive the first byte of information back from the server allowing the user can read the content. Check this metric with your web Hosting providing to make sure you are giving the content in a snap. Read our detailed blog on this. Check out Nexcess. Make sure that this configuration is set up in a way to have lesser Start Render Time. Any content loaded onto the browser window must take less time for the user to see and make sure you are able to serve the content from a cache. Though Page load time is a key factor in website performance and your content should deliver online when and where your customers are online. A content delivery network system can help you in scheduling and be making a timely delivery of content at desired locations. On the other hand, with an e-commerce site serving multinational customers, you need to provide content in their specific language. A Content Delivery Network system like Akamai can serve best for such purposes. Setting up an integrated e-commerce website is not be enough. You need to match your customer expectations. Magento has come up with design themes and is grouped with design packages. We, at i95Dev, understand the online revolution you want to bring through your website. Hence, we understand your industry and your customers first. We analyze your present state of business and online presence. All these details help us in drawing a demo of improvements and suggestions. Feel free to drop an email info@i95dev.com. We are Magento partnered online store development agencies in the US, Australia, and India. Have you read our previous blog on Top 3 Concerns of a Customer Shopping Online?